Every Child a Maker: How the government and private sector can turn kids on to science and engineering through Making. Photograph by Saul Loeb/Getty Images. Joey is a self-described “Maker,” part of a growing community of young people and adults who are designing and building things on their own time. About 120,000 people participated in the May 2012 Maker Faire in San Mateo, Calif., sharing projects such as a flame-powered pipe organ, a fully automated ragtime band, and a 12-foot-tall aluminum robotic face controlled by 12 joysticks. Sixty “mini-Maker Faires” are planned this year alone. The Maker Movement is important for a variety of reasons. First, it promotes values that are ends in themselves, such as creativity, problem-solving, collaboration, and self-expression. Second, it has the potential to get more boys and girls excited about STEM, in the same way that chemistry sets inspired previous generations of scientists and engineers. Third, many manufacturing companies complain that they have many job openings they can’t fill, and they need more welders and machine tool operators. The Maker Movement could promote a renaissance of “shop class,” which was historically a pathway to practical skills and middle-class jobs. Finally, communities of hobbyists are often hotbeds of innovation. As Steve Wozniak, the co-founder of Apple and the designer of the Apple II computer, observed, “without computer clubs there would probably be no Apple computers.” Many of the innovations of the personal computer industry were developed by members of Silicon Valley’s Homebrew Computer Club. Similarly, some Makers are becoming entrepreneurs, and are leading the development of industrial robots, 3-D printers, and smart devices that integrate hardware, software, sensors, and Internet connectivity. 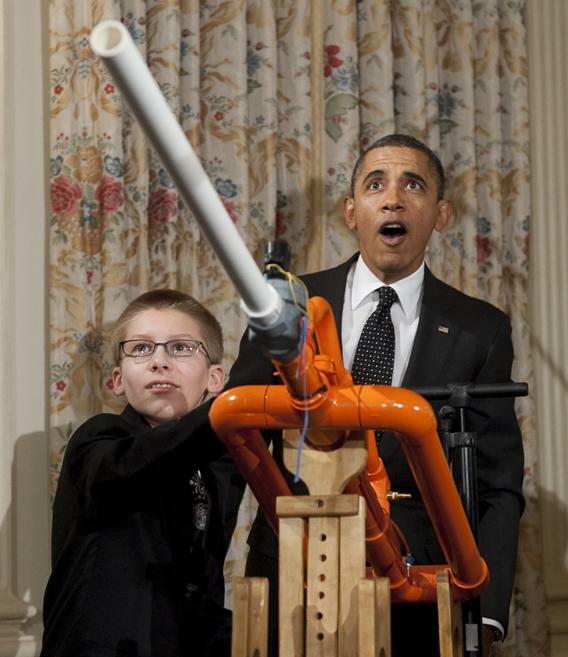 One exciting new effort that responds to President Obama’s call to action is the Maker Education Initiative (MEI). Launched with leadership from Dale Dougherty, a White House Champion of Change and founder of Maker Faire, with support from founding sponsors such as Cognizant, Intel, and O’Reilly Media—this initiative aims to create more opportunities for young people to make, and—by making—to build confidence, foster creativity, and spark interest in STEM, the arts, and learning as a whole. The MEI will focus on expanding the number of maker spaces in both school and after-school settings, developing hands-on projects for young people of all ages and interests, and recruiting mentors who can share their passion and expertise with the next generation of Makers. Federal agencies are already beginning to take actions to promote “making.” DARPA, the agency that gave us the Internet and GPS, is investing heavily in the tools needed to democratize design and manufacturing. As part of this effort, they have launched a program called MENTOR, with the goal of empowering students from 1,000 high schools to design and build things like robots and go-carts. DARPA and the Department of Veterans Affairs are teaming up with TechShop to open up new locations near Washington, D.C., and Pittsburgh that will be open to veterans and to researchers working on DARPA projects in flexible manufacturing. NASA is promoting “Do It Yourself” space projects, such as “smartphones in space,” to dramatically increase the number of people involved in space exploration. The White House Office of Science and Technology Policy is encouraging all agencies to provide R&D funding for entrepreneurs with good ideas for low-cost instruments and kits for Makers and citizen scientists. Companies concerned about the lack of students with strong skills in STEM and manufacturing could support maker-spaces in schools and after-school programs, and provide their employees with time off to serve as mentors. Youth-serving organizations with an ability to reach millions of boys and girls could recruit Makers to develop programs at the national, state, and local level. Science museums could serve as “hubs” for Making in the regions they serve by creating maker-spaces and providing professional development for teachers. The New York Hall of Science, the Pittsburgh Children’s Museum, and San Francisco’s Exploratorium are already demonstrating what’s possible when science museums devote their expertise and social capital to Making. Individual Makers could serve as mentors and the leaders of local chapters of organizations such as the Young Makers Club. Foundations and philanthropists could provide matching grants to communities that are interested in embracing Making, in the spirit of Andrew Carnegie’s support for public libraries. Philanthropists should make a special effort to ensure that girls and under-represented minorities are included in Making. Working together, we can prove that in America the future is, indeed, what we make of it. Also in Slate’s special issue on science education: Fred Kaplan explains why another “Sputnik moment” would be impossible; Philip Plait explains why he became the “Bad Astronomer”; Paul Plotz describes how almost blowing up his parents’ basement made him a scientist; and Dana Goldstein explains why you should make your daughter play video games. Also, share your ideas for fixing science education in the Hive. This article arises from Future Tense, a joint partnership of Slate, the New America Foundation, and Arizona State University.